This is the second and final project in my 18th century October series. I’d hoped to make a menswear ensemble too but that didn’t end up happening, and this dress is to blame! It ended up being way more detailed and time costuming than I had expected. 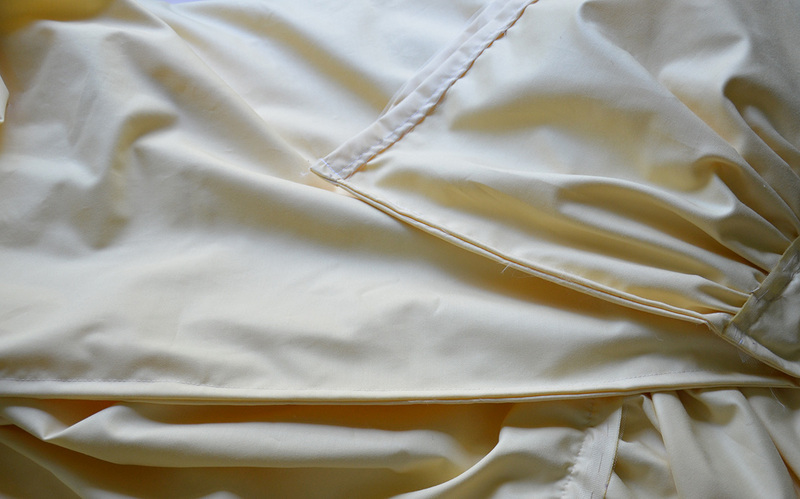 Today i’ll be talking about the long process of making a pale yellow underskirt. This piece is really just an accessory, the real star is a striped Robe a l’anglaise which will be worn overtop. 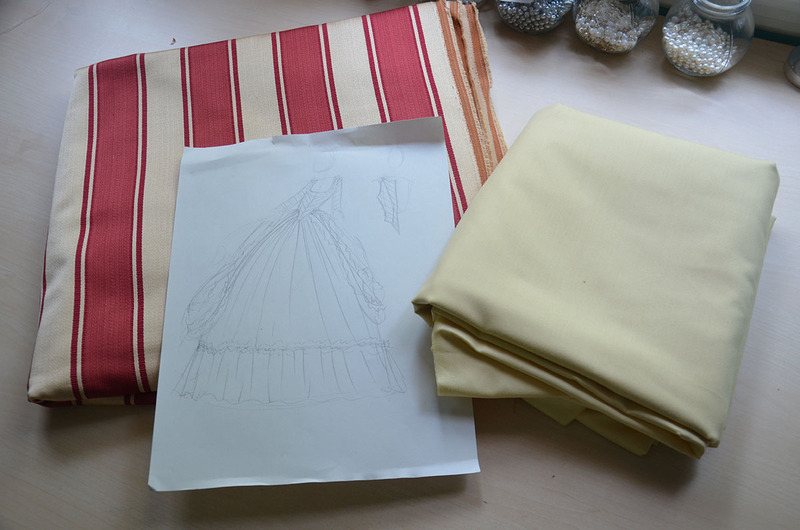 For this project i’m using a lovely red and yellow striped upholstery fabric and a yellow twill sateen. 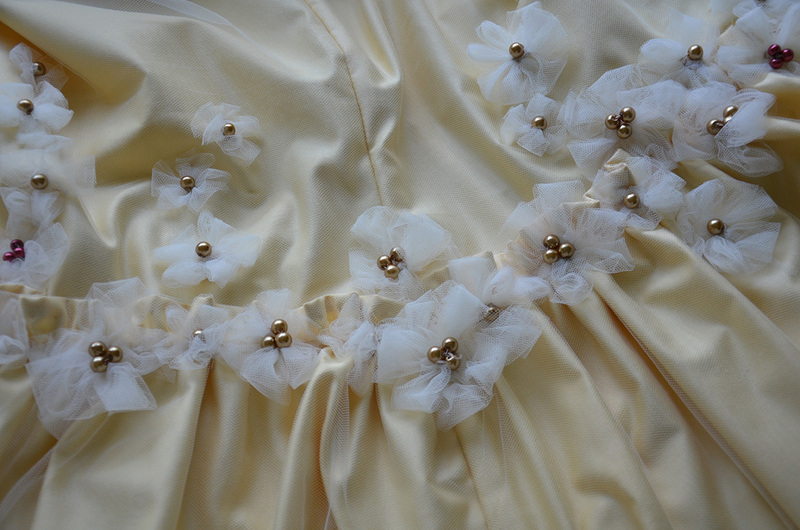 I also ended up using ivory tulle as an overlay and several hundred pearls for decoration. 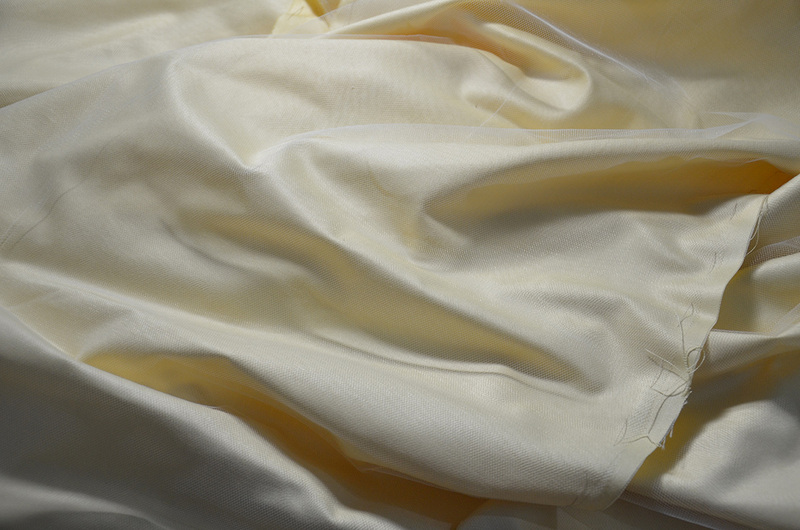 Despite searching everywhere for a fabric that matches the yellow tone in my striped material I couldn’t find anything. 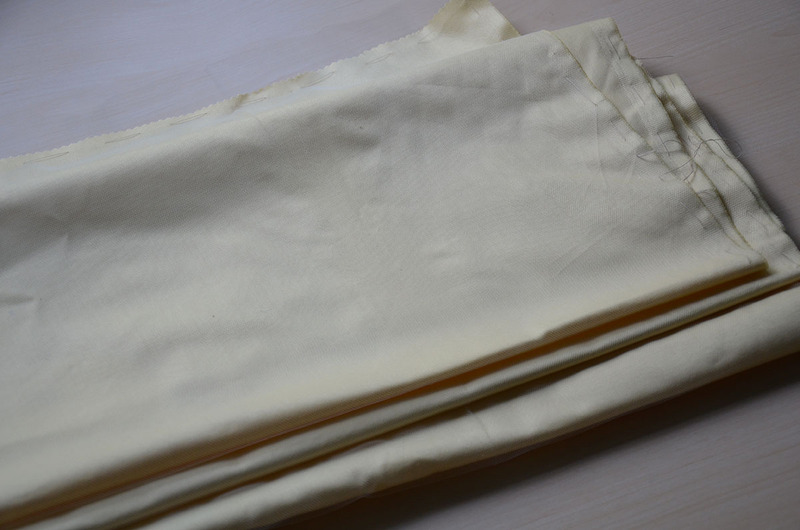 Fabric is either too yellow, or not yellow enough, or too dark! 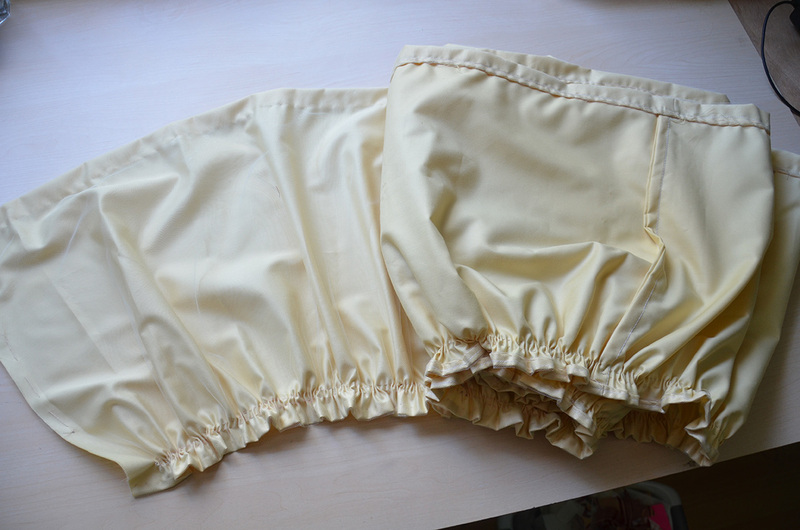 I ended up using yellow twill (which doesn’t actually match) and adding a tulle overlay to create texture and hopefully desaturate the color enough to make them match. It didn’t work, but hey, I tried! I started by cutting out the skirt. The skirt has two main pieces, an upper section, and a lower section. I lost my measurement sheet so I can’t tell you the dimensions of these, but they were both rectangles. One was three yards long and the other way six yards long. 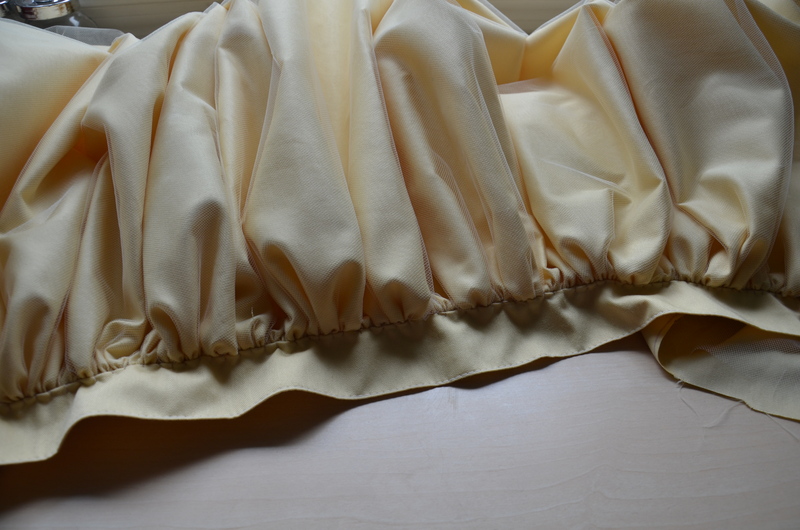 The six yard piece was much thinner since it creates the ruffle at the bottom of this skirt. This is the upper part of the skirt. I cut tulle that was the same size and basted it on with very large stitches. I didn’t have a large enough desk to lay this out all the way so the process was very slow. 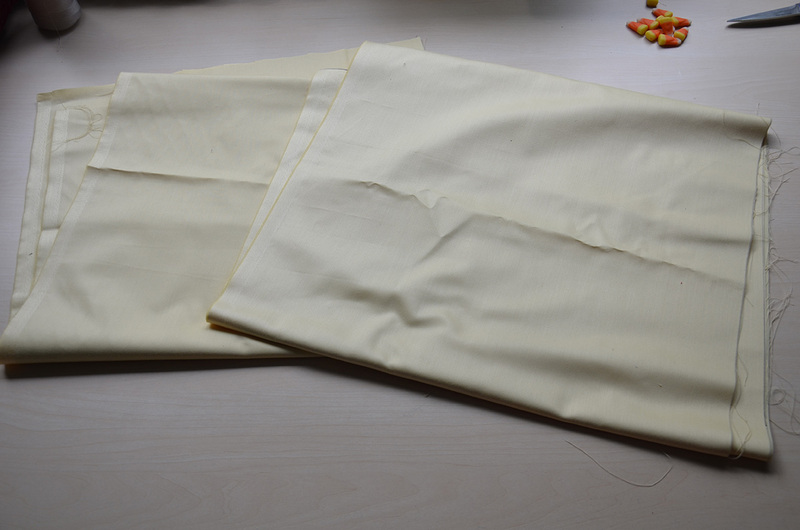 The six yard strip was made of three pieces which were sewn together with french seams. 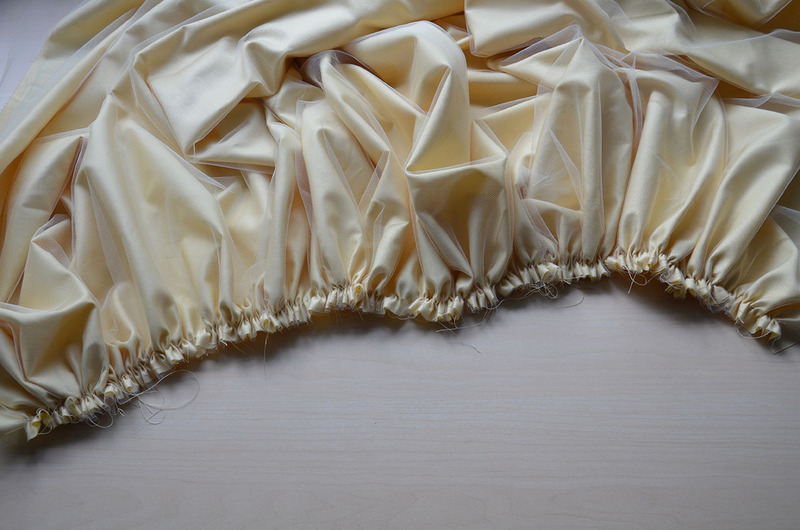 Then I repeated the process used on the upper section of the skirt and hand basted tulle overtop. Then it was time for hemming! I decided that I should hem everything by hand, because thats the sort of stupid decision that I make on a regular basis. 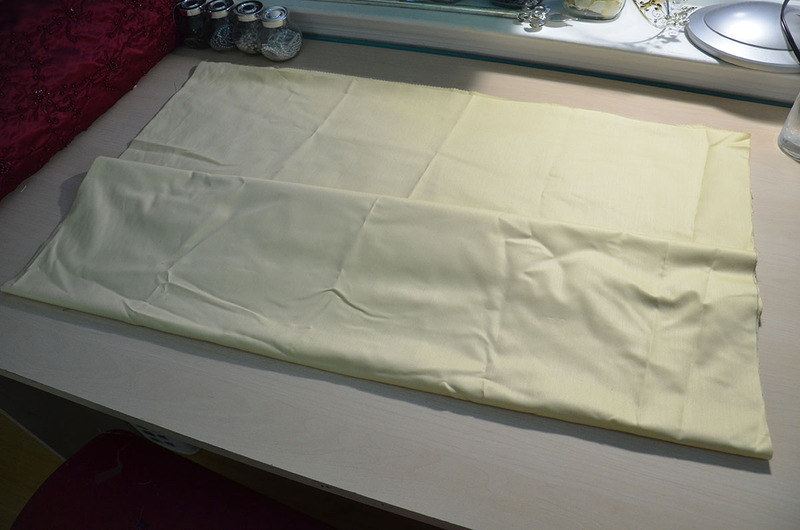 I actually like hemming things by hand, but this ended up being super tedious since I did it all in one sitting. 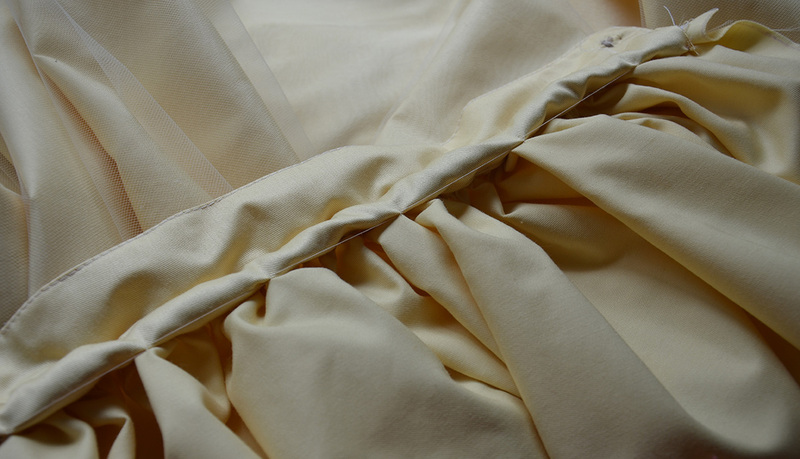 The top has a quarter inch rolled hem which was also whip stitched in place. Then I hand the thing down until it was three yards long. I divided the fabric into four fifty four inch sections and made sure each section was gathered down to twenty seven inches. I probably should have used smaller sections to ensure the gathers are even, but this worked pretty well. 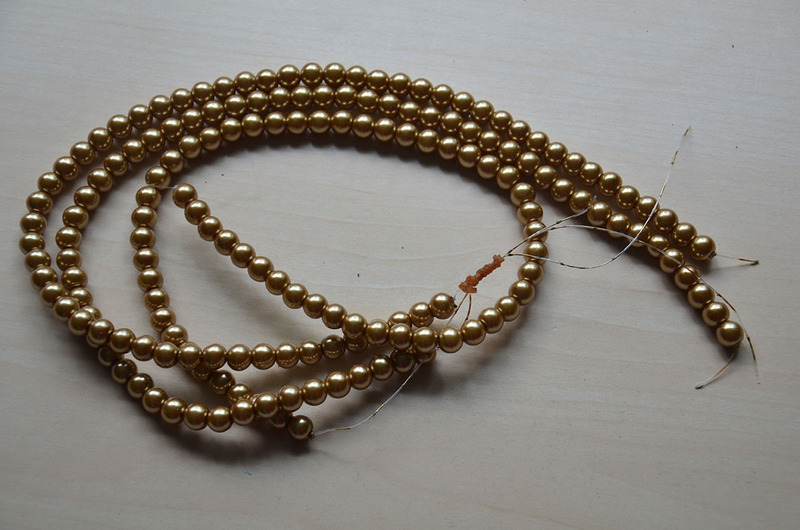 I made two rows of gathers to create a smoother surface to sew my pearls onto. 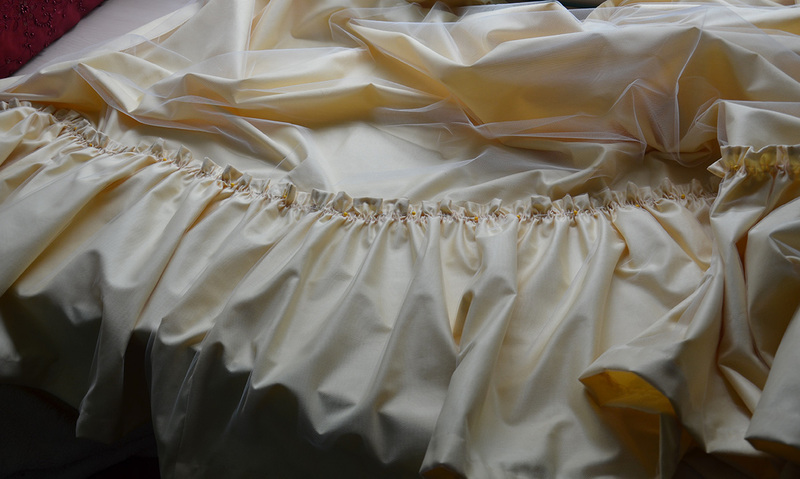 My ruffle got set aside and it was time to focus on the upper section of the skirt. Before I could do much with it I needed to make the waistband. 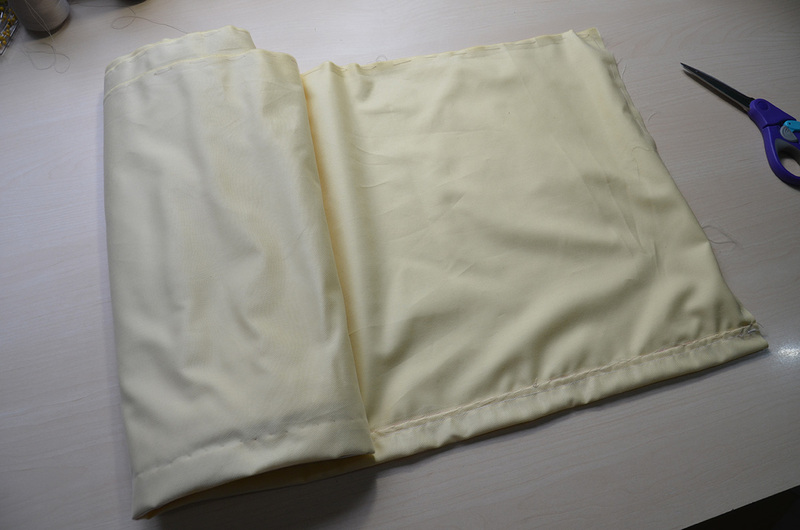 The waistband was also a rectangle of twill fabric, but I reinforced it with a lightweight interfacing. 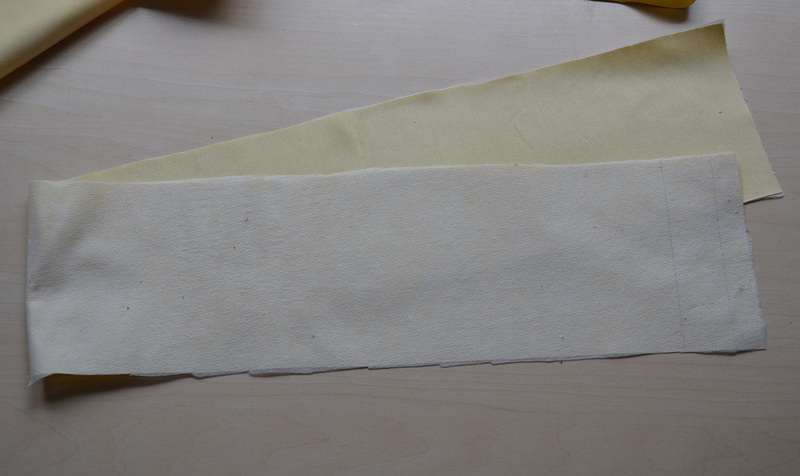 I folded the strip in half and sewed the edges together with the “right sides together” method, then top stitched around each edge. The last step was sewing a button hole and attaching a button! I originally made covered buttons with matching fabric, but they ended up being too big. 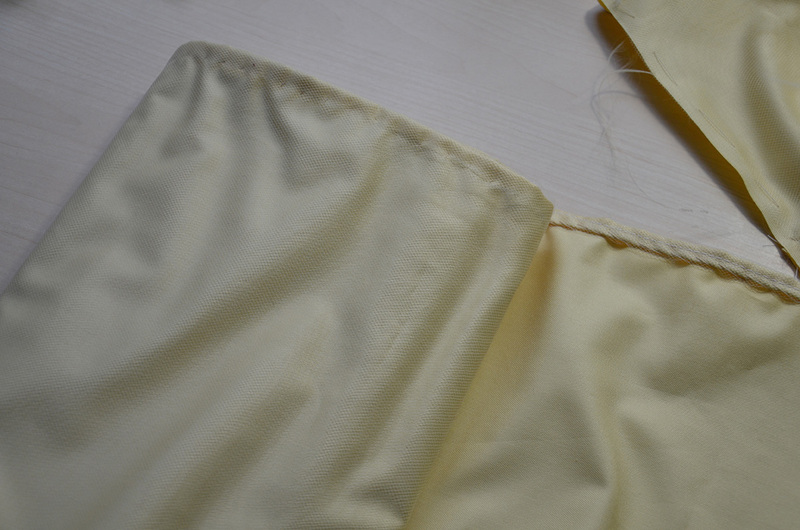 I gathered the top of my skirt until it was the right length, then stitched it onto the waistband. I folded a strip of leftover fabric into something resembling bias tape and used that to seal off the edges. I also tacked this to the skirt so it would stay facing down. At this point my skirt looked like this, which was pretty disappointing considering how long I had spent on it. 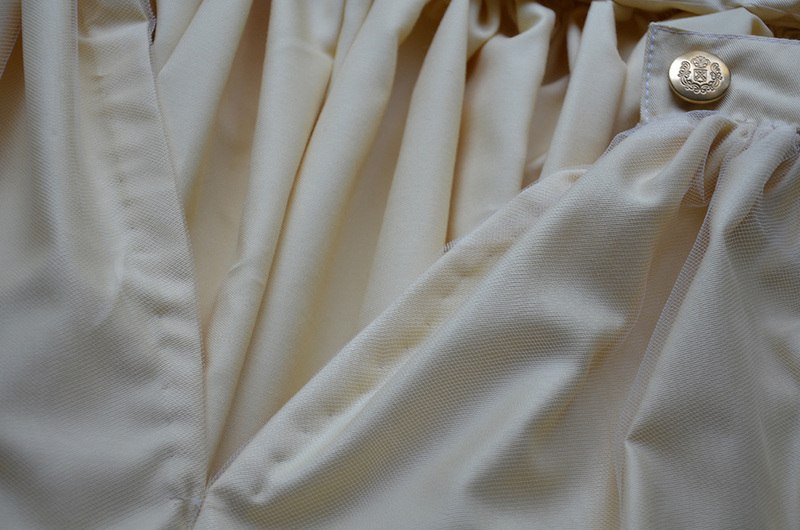 The next step was sewing on the ruffle, I used my machine for this because it would be hidden by pearls later on. 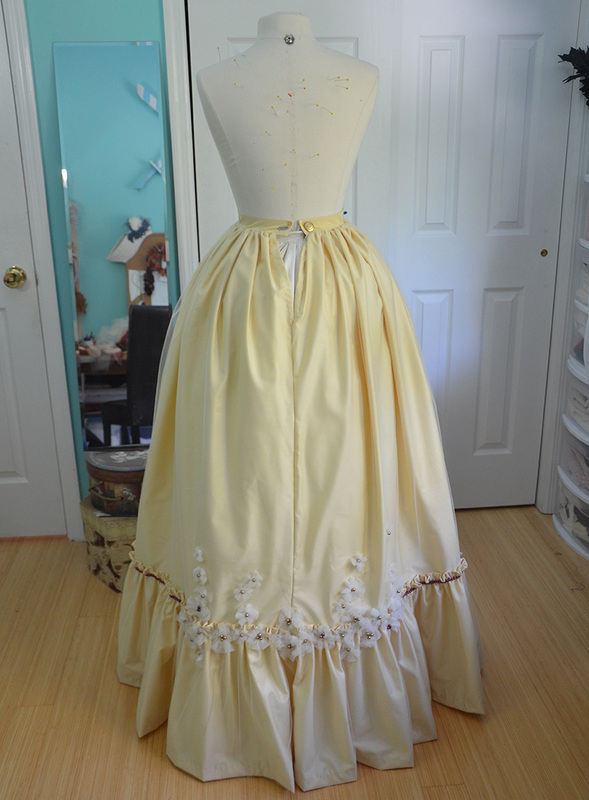 After attaching the ruffle and building up my dress form with the proper petticoats this looked a LOT better! Then it was time for the detail work. I ordered a heap of glass pearls from etsy in colors that matched my striped fabric. 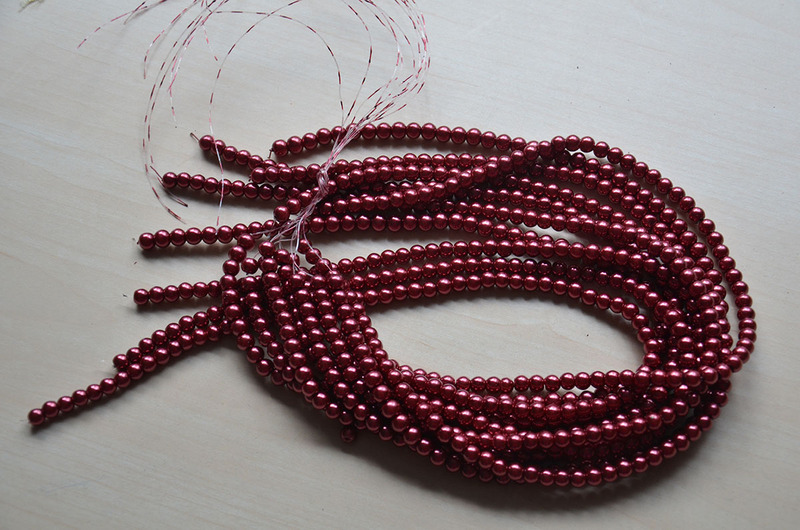 Unfortunately they only had ten strands of red 6mm pearls in stock, and I needed twelve. I decided to leave a twenty four inch gap free of pearls in the back of the skirt. 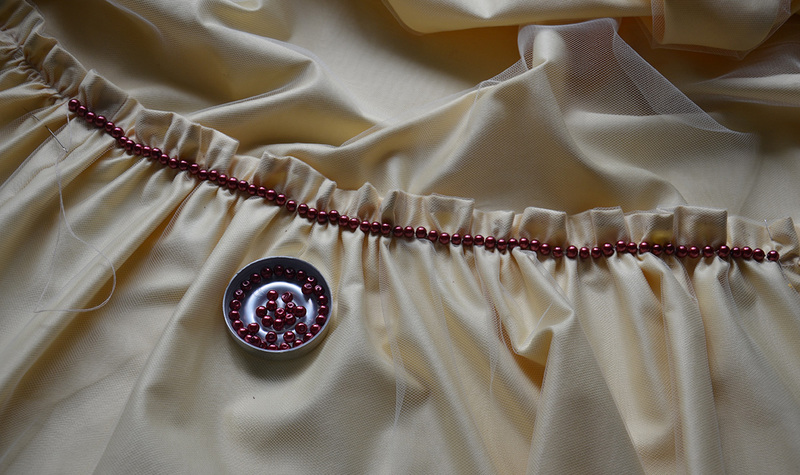 This part will be hidden by the overskirt and leave me with enough pearls to use them the way I had planned. 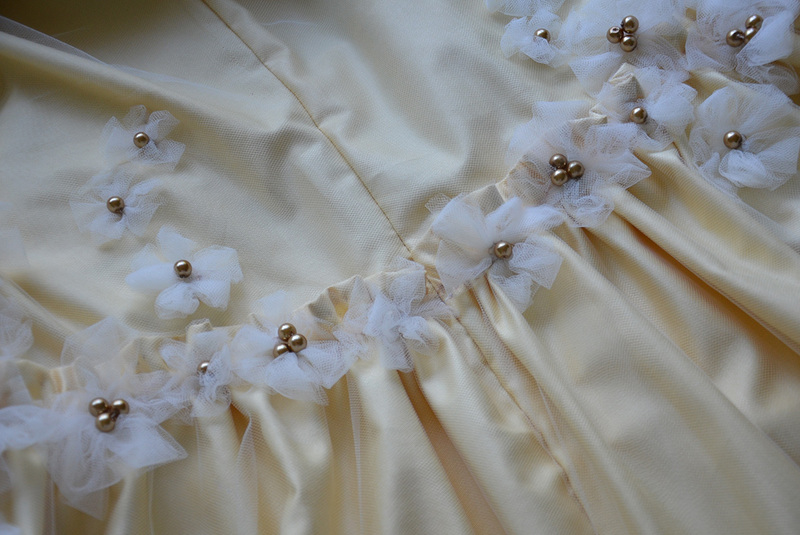 But it did look sort of stupid having this empty space on the skirt, so I decided to make tulle flowers to cover the gap. 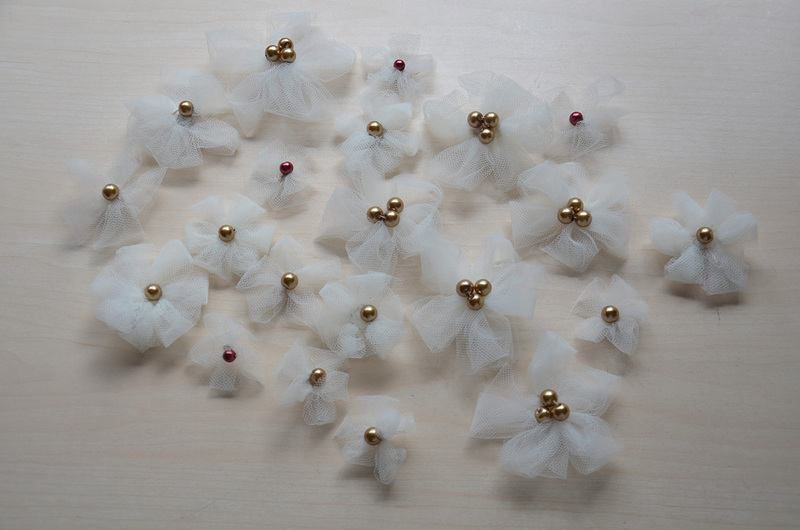 I made these from tulle strips. I folded the strips into loops and wrapped thread around the bottom of each loop. Once I had five or six loops I stitched them together in the center to create something that resembles a flower. To jazz them up a bit I added pearls to the centers. 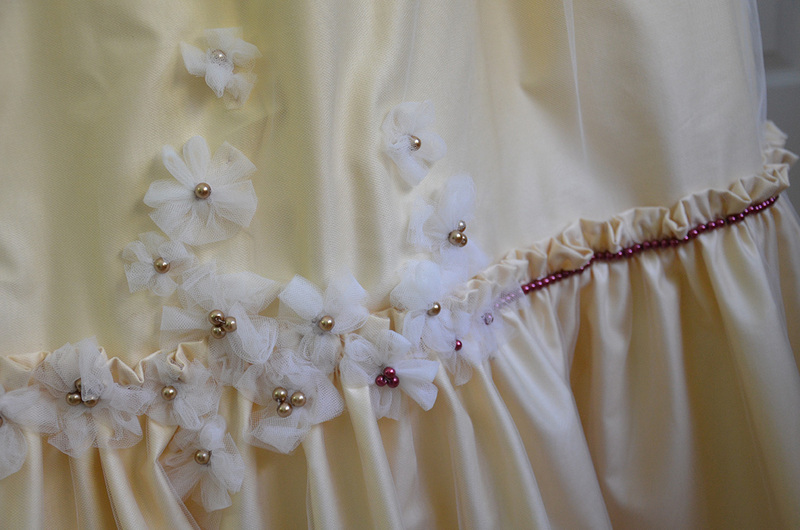 Then it was time to sew pearls onto the skirt! I did this one by one and it took a really long time since I had over 500 to attach. I haven’t really done something like this before and it was surprisingly soothing, like hemming but with a much prettier end result! 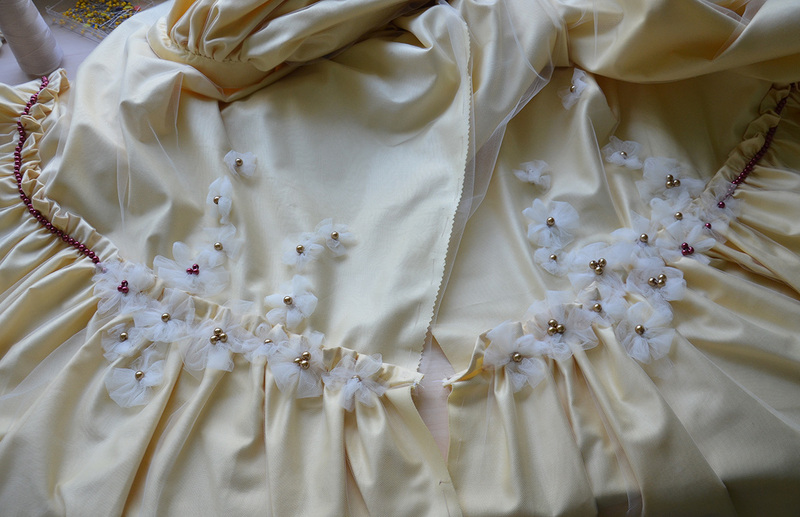 Once I finished sewing on all the pearls it was time to add my flowers! 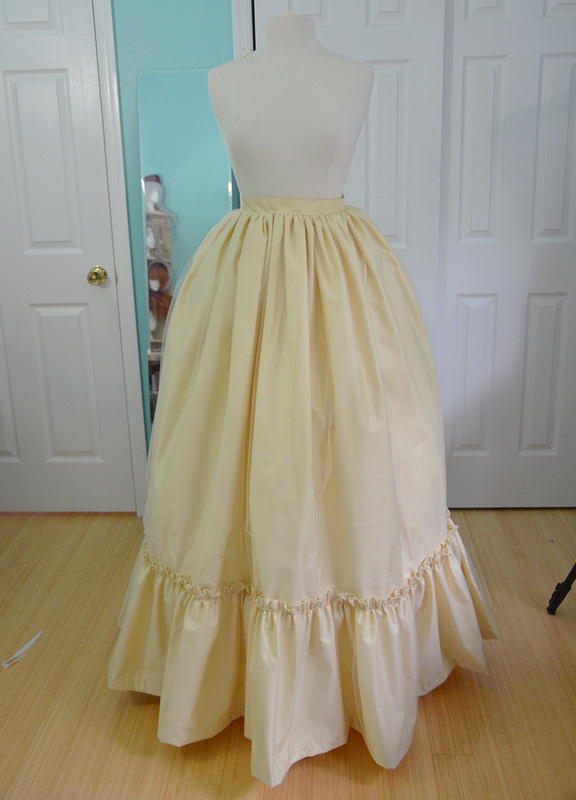 When that was done I did up the back of the skirt with a french seam. 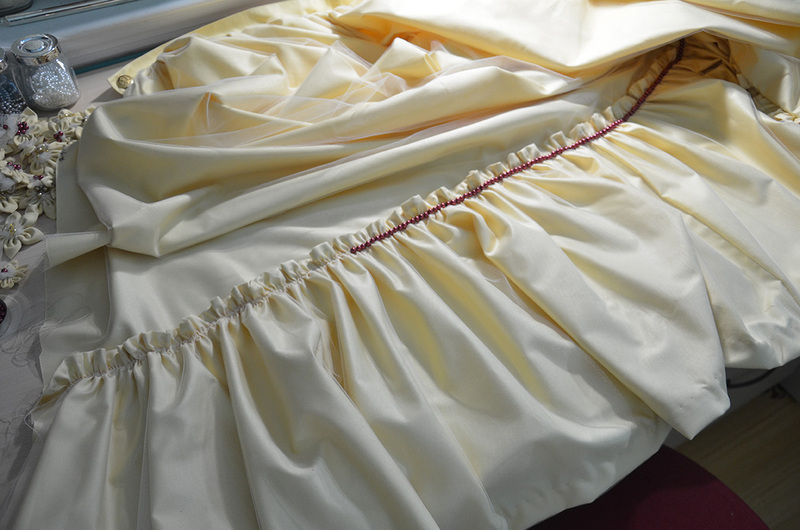 I left a six inch gap at the top of the skirt and rolled the raw edge inward twice to create a finished edge. Usually I would use snaps or hooks to keep this shut but since this is an underskirt I decided to leave it open. 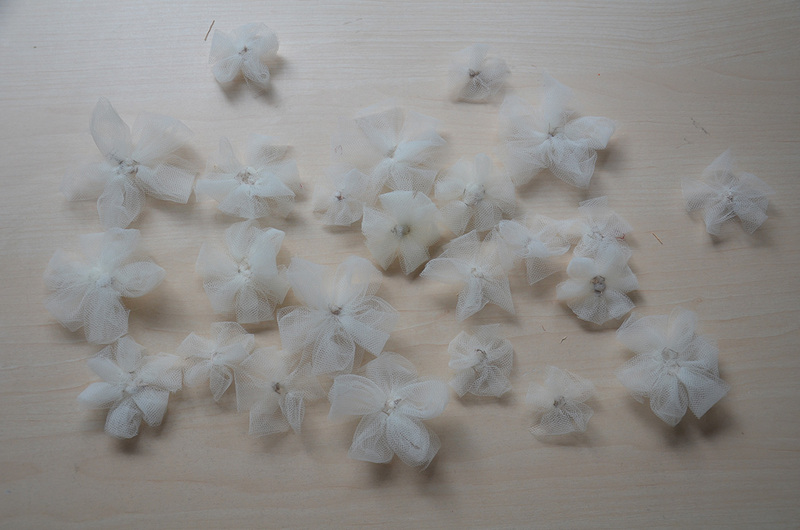 There was an ugly flowerless gap where the seam was, but luckily I saved a few tulle flowers which I sewed on after the seam was done up. So everything looks flowery and lovely! 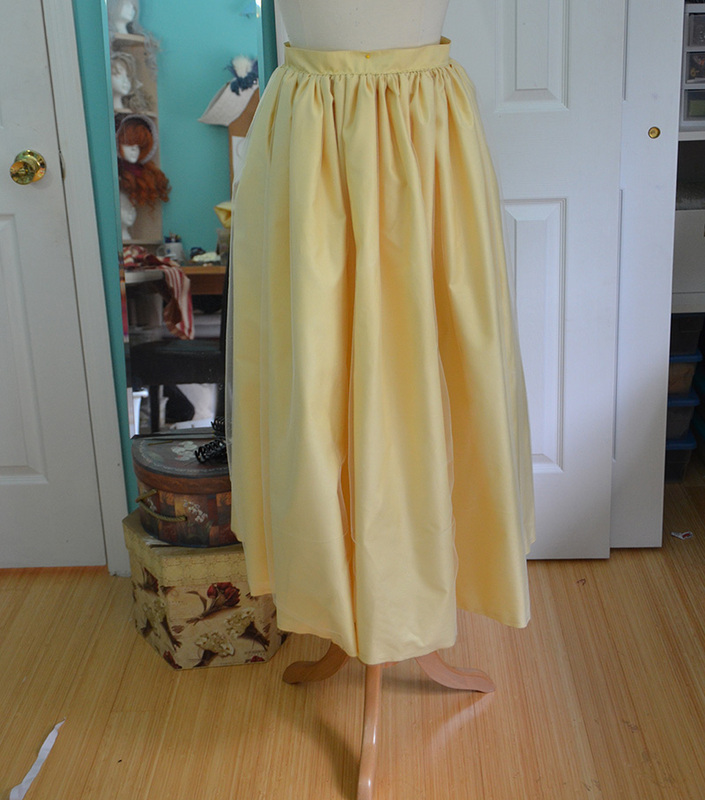 And the skirt was complete! I made this over the course of a week but there was so much hand sewing involved that it felt much longer. In the end I’m really pleased with how it turned out, the whole project went smoothly. Even though it’s a simple design that’s something to be grateful for, mistakes are all the more noticeable on simple projects! Great idea to finish off that gap at the back with no beads. 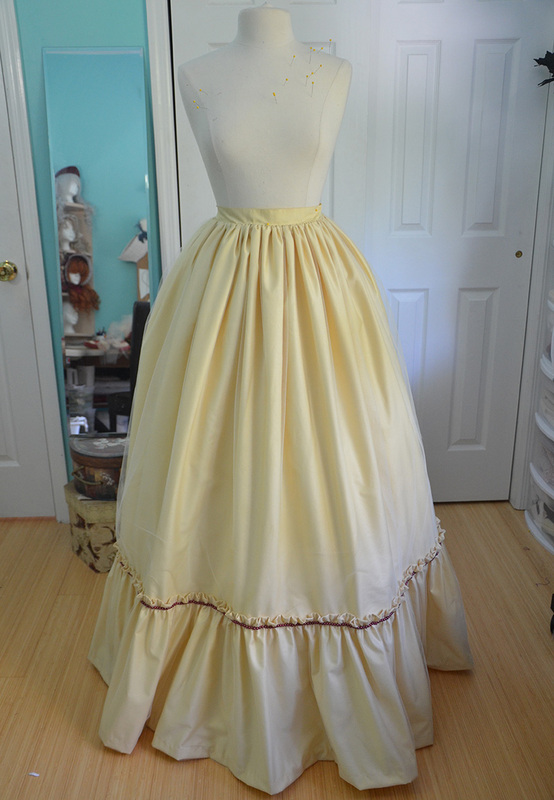 It is amazing the amount of effort in this underskirt. Are you following another painting as inspiration? Have you had a chance yet to show your work to people who would be interested in gowns for historical purposes (?) 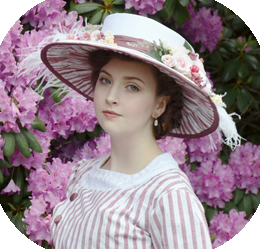 costume For period dramas? Or what is ‘the plan’? Am I being too nosy? I just think someone, lots of someone’s, need to see your work. once again, completely beautiful! The flowers look very nice in the back, that was a great idea to use them in place of pearls. I can’t wait to see the rest!